Jaguar Reef Lodge is located on 300 acres of wilderness in the Stann Creek District, just one mile south of Hopkins Village. 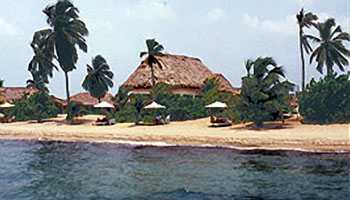 The Lodge is also near a number of Belize's national parks, Mayan Ruins, and world famous diving and fishing spots. Jaguar Reef Lodge offers a number of tours to explore the eco-wonders of Belize's diverse wildlife and landscape. Guests have free access to kayaks and mountain bikes to undertake their own adventures. The Lodge features 14 cabanas and four spacious seafront two-bedroom suites on its own private 1,000 ft. prime, white sand beach, ideal for sunbathing and swimming. Each cabana and room has cool Mexican tile floors, air-conditioning and a full bath with tub and shower. Hardwoods, saltilla, and ceramic tile and brass are used throughout, along with traditional materials like bay leaf thatch roofing. Combined they lend an air of authenticity and quality to this tropical paradise. Guests will definitely feel like they have "gotten away from it all" while staying at Jaguar Reef Lodge. All this and surprisingly, the Lodge has one of Belize's most modern and well-equipped kitchens, and its chefs consistently receive rave reviews. Four-course breakfasts, tastefully prepared lunches, and multiple choice entres at dinner will keep everyone well fed! In the evening guests can take a ride into Hopkins Village where the local Garifuna people make one feel right at home. A wealth of natural wonders to enjoy, including pristine rainforests filled with exotic plants and animals, as well as one of the world's largest coral reefs teeming with sea life, make a stay at Jaguar Reef Lodge a truly memorable vacation.